Tour The Game of Thrones has reached another milestone – the first position on #1 Travel website TripAdvisor as the best ranking tour in Dubrovnik! 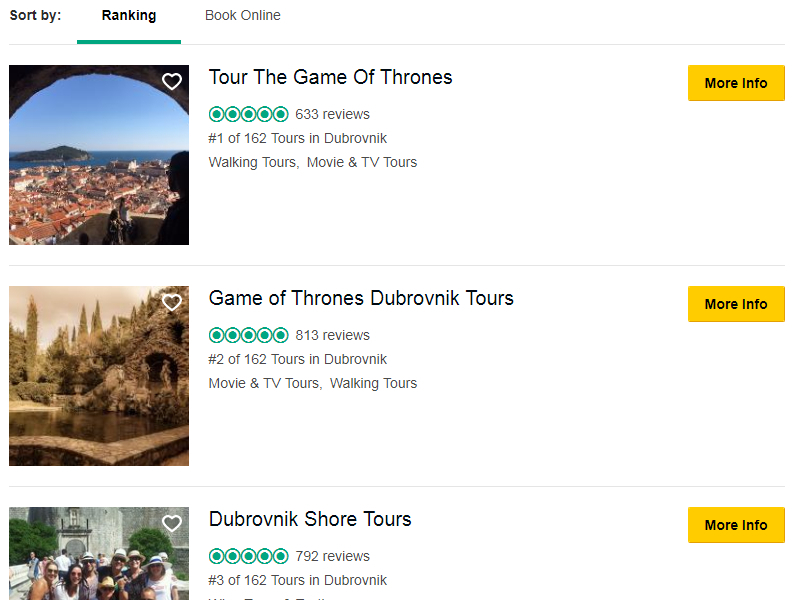 We would like to thank all the devoted Game of Thrones fans that toured with us whose reviews helped us become the best rated tour in Dubrovnik! Tour The Game of Thrones is #1 on TripAdvisor! Our road to the top wasn’t easy and it took a while to reach this position. Our listing on TripAdvisor was opened about two years ago and since then we were slowly moving up in the TA’s popularity ranking. The touring market in Dubrovnik is vibrant and the new agencies and touring companies are springing up on daily basis. Currently, there are over 160 tours advertised on TripAdvisor in Dubrovnik. Most of these tours are conducted by large agencies that run massive group tours which are easily able to muster great deal of reviews thanks to their broad networks. Their leaflets and flyers are all over the place, they employ a large workforce and have a number of booking locations on site in Dubrovnik. On the other hand, Tour The Game of Thrones is promoting its services only through the Internet. We are running customized private Game of Thrones tours, which are specifically tailored towards the client’s own preferences. Our tours don’t simply cover the filming points from the show, they are providing an intimate personalized experience of Dubrovnik. Our guides are true knowledgeable locals as well as the devoted fans of the GOT and A Song of Ice and Fire book series. Our tours are not massive and we’re not combining different tour inquires into “small touring groups” like some other agencies like to advertise. The way we see it is that the tour is either private tour or a group tour (Tyrion Lannister might’ve added that size doesn’t matter as a “small group” is still a group :-). We ONLY run PRIVATE affordable tours. 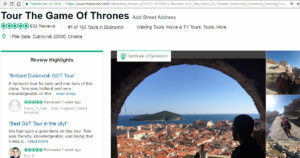 We are also proud to say that we pioneered the Game of Thrones Tour of Dubrovnik as early as in 2012 when none of the other touring companies had the idea what show was actually being filmed in Dubrovnik. Now there are dozens and dozens of different companies advertising their GOT-themed tours which differ by duration and quality. The only thing they have in common is the fixed departure times, some GOT content and the desire to cram up as many people as possible in the touring group. This is why we find this achievement so rewarding. After spending an eternity ranked as #3 and #2 on the list of Tours in Dubrovnik, we finally made it to the top. And this is all thanks to you – our fellow Game of Thrones fans that gave us your confidence and recognized our efforts. The TripAdvisor ranking can change, but our gratitude will always remain. Thank you, dear GOT fans again for all those kind reviews and for putting your trust in us. Our guide Tom was great and could not have been more helpful and knowledgeable. There were 8 of us including a wheelchair user, a 2 and a 4 yr old - cross that with a mini bus that needed parking and a city that we wanted to learn about and it's wasn't an easy ask - but he did it and we all left Dubrovnik feeling that we had seen and knew alot more than when we began. Also the Game of Thrones fans in the party were thrilled! So wonderful to see the city through the eyes of someone who knows it.